Chorizo is a unique sausage in that it is not often eaten on its own. 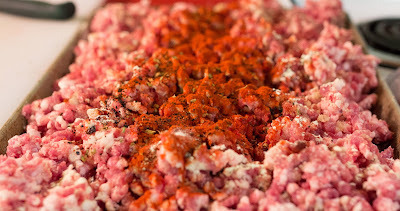 Usually it's not even stuffed into casings; it's just used loose and added to eggs, stuffed peppers, beans, or rice. 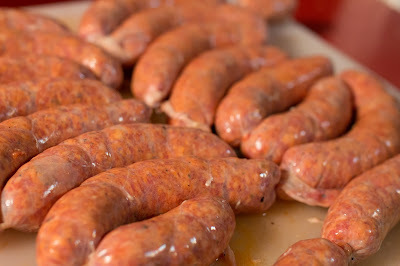 There's also a dry cured version that's a tapas essential, but that's a sausage to be discussed at a later time. 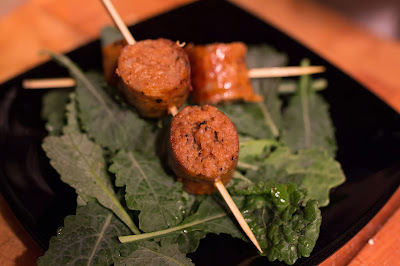 Fresh chorizo is very versatile, but I usually don't like most store-bought fresh chorizo. It's either bland, paprika-dyed pork, or too hot and one dimensional. It's never "just right." To make my own sausage, I started with a good, garlicky base of hot, fragrant zemo garlic from a local organic farm. To the minced garlic I added smoked paprika, which is a classic addition to chorizo, both fresh and dry-cured. Smoked paprika comes in mild and hot varieties. I wanted to get a good smokey flavor, but not be killed by heat, so I opted for the mild. For depth and some heat, I added dried ancho chilies, which are big, black glossy dried peppers (called poblanos when fresh). Ancho peppers add a slightly fruity flavor, along with a savory heat, so you really get to round out the flavors of garlic, smoke, and heat with them. Tasting a small sample, I added a bit of cayenne just to boost the heat slightly. Cayenne's pretty neutral in flavor, so it just brought the heat up a bit to get your mouth tingling. I packed my fresh chorizo into casings, as I do like the option to have them whole for serving. The finish sausage is very rich, with an intense flavor that takes your mouth on a rolicking trip from the savory, salty pork, to the sweet aromatic peppers and paprika, ending on a spicy, garlicky finish that gets your mouth watering.